As you read this I should hopefully be in a state resembling some sort of regenerative coma, a slightly more mainstream and fundamentally less cool version of the Odin Sleep. For I will have only just returned from my holidays. Finally returning to my seat of power after wild adventures in Devon and Nottinghamshire. I will be a drained and empty husk, my vital life essences depleted after so long away from the dark and eldritch energies that coarse through my lair. I expect to be so utterly incapable of cognitive processing or even basic motor control, that this post is being written ahead of time. Thus I come to you, through the mist of time, from June 8th. In what I can only described as a very shoddy approximation to a real time machine. But June is over, June is gone. Now is July. It is the month when the summer holidays started when you were back at school. Six weeks that seemed to stretch on into infinity. Six weeks of perfect sunshine, days unblemished by rain. Of days in the garden, or down at the beach. Or in my case, crunching your way through Final Fantasy 8 and then pretending you’d been out playing football all day when your dad came home. But let us not dwell on nostalgia, for nostalgia is a drug. A highly addictive drug that makes both heroin and crack cocaine seem just “moreish” or “scrummy” by comparison. This is just hyperbolic though. Don’t do drugs. Unless they’re the sort prescribed to you by a legitimate and registered member of the human medical profession. Rambling aside, time for the Pictonaut Challenge. This month it’s Sand Sea. Try as I might I haven’t been able to find the source of this image. Back searching for it just leads to a score of wallpaper websites, half of which I invested with pop-ups and lurking viruses. There’s a signature of sorts in the bottom right corner, but try as I might, I simply cannot make it out. Putting attribution frustrations to one side. 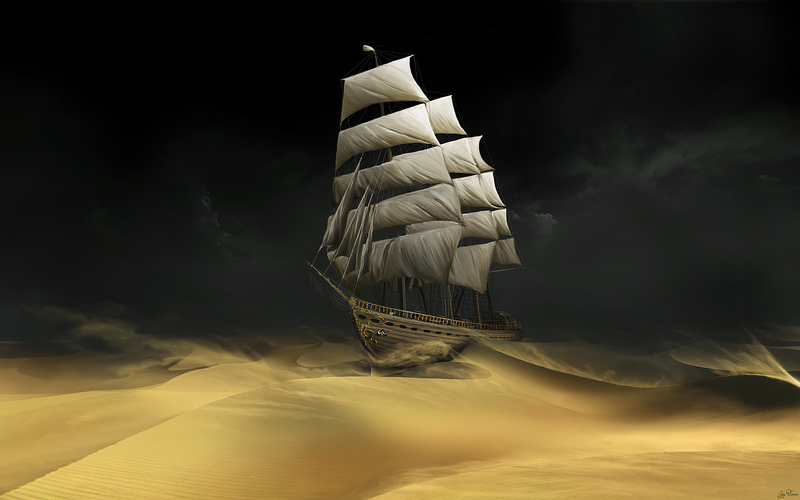 We have a caravel with its sails fully unfurled, a storm on its tail and its keel splitting a dune in twain. But is the ship moving? Is it marooned and run aground? Is there even anyone on board? These questions, and more, are yours to answer. This entry was posted on Monday, July 1st, 2013 at 12:06 pm	and tagged with July, Pictonaut Challenge, Pictonauts, Sand Sea, Short stories, Writing and posted in Pictonauts, Writing. You can follow any responses to this entry through the RSS 2.0 feed. We all have our own skills. I’m completely useless at editing and proof reading.